The Building Digest: Seems like a no-brainer. Installing rafter ties have always been a dreaded task when framing any project. Tedious and time consuming, it can eat up valuable profits. What if we told you there was a new way ... that is less $ and FASTER! Check it out! 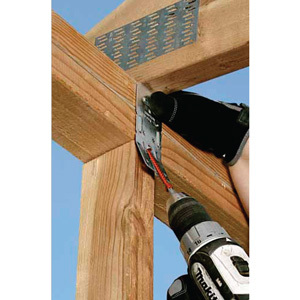 The Strong-Drive® SDWC TRUSS screw provides a stud-to-bottom plate or stud-to-top plate connection as well as a method to fasten trusses and rafters to top plates. The fully-threaded shank engages the entire length of the fastener providing a secure connection. The SDWC is tested in accordance with ICC-ES AC233 (screw) and AC13 (wall assembly and roof-to wall assembly) for uplift and lateral loads between wall plates and vertical wall framing and between the top plate and the roof rafters or trusses. The Strong-Drive® SDWC provides a time-saving and reliable option to fastening trusses and rafters to wall top plates. The SDWC offers fully tested loads in accordance with ICC-ES AC233 (screw) and ICC-ES AC13 (roof-to-wall assembly), and installs easily and effectively without pre-drilling. For more technical and installation information, click here.